Check for leaks in your toilets at least once a year. Add 10-15 drops of food colouring to the toilet tank, leave for 15 minutes and then check. If you see any colour in the bowl, there is a leak which needs to be fixed. Approximately 20% of toilets leak. Fix leaky faucets right away as these can account for as much at 5% of all indoor water use. Replace older toilets with high-efficiency, low-flow or dual flush toilets, which use as little as 5 lires per flush as opposed to 15 litres for traditional toilets. Install high-efficiency, low-flow aerators on all faucets. These restrict the flow and can cut consumption by 6%. Prices start at about $1. 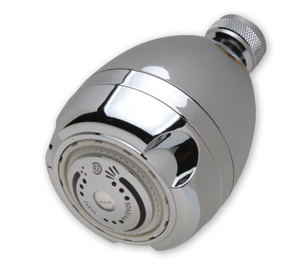 Install high-efficiency, low-flow showerheads. Prices range from $5-$20 and they take less than 10 minutes to install. Ensure that hot water pipes are insulated - costs about 15¢ a foot! Buy a “Retrofit Kit” from a hardware or plumbing store. 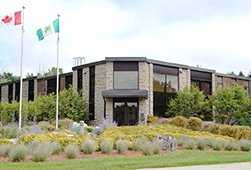 A typical kit may contain two low-flow showerheads, two toilet tank displacement devices and two toilet tank leak detection dye tablets, as well as literature on efficient water-use practices. Decreasing indoor hot water use will save you in energy costs as water heaters account for about 15% of a home’s total energy requirements. 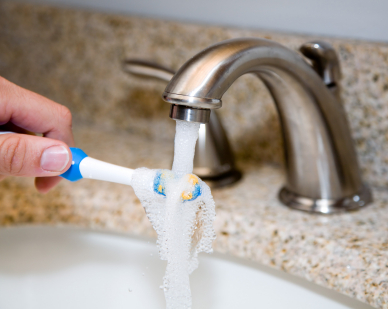 Turn off the water when brushing your teeth, shaving or washing. Clean fruits and vegetables in a pan instead of running the faucet. Plan ahead - thaw food in the refrigerator instead of under running water. Run your dishwasher and washing machine only when full. Front loading washing machines cost more but they use 1/3 less water per load. Washing machines with the “Suds Saver” option are suggested. Water your lawn only when needed, or not at all. Walk on your grass to find out if it needs watering; if you leave footprints, it may be time to water. If not, the lawn probably does not require it. Water in several short sessions: three 10-minute sessions an half-hour apart. This encourages deeper, healthier root systems. Adjust your lawnmower to a higher setting and mow more frequently. Longer grass blades (2½-3")provide more shade and helps retain moisture. Water your gardens and flowerbeds in the cool of early morning or late evening to decrease evaporation which can be as much as 30%. If it doesn’t grow, don’t water it! Ensure that your sprinkler is positioned so that water is not wasted on sidewalks, gutters or paved areas. Lay 2" of mulch around trees and plants to retain moisture. Clean hard surfaces with a broom, not a hose. Wash vehicles with a bucket and sponge instead of a hose. Get a cover for your pool and cut evaporation up to 90%.